Critical thinking (CT) has assumed the status of an obligatory graduate attribute in Western English-medium instruction higher education, with accompanying expectations that such thinking be evident in students’ academic literacy practices. These literacies are presented to students from outside English-dominant settings as higher-order language skills, as evident in, for example, English-for-Academic-Purposes programs, reflecting widely-held assumptions that CT is not a dimension of academic literacy practices of many non-English dominant education systems, particularly those reductively categorized as ‘Asian’. In this chapter, we use interview data from multilingual Chinese academics of diverse ethnolinguistic backgrounds to scrutinise assumptions that CT is not recognised nor encouraged in Chinese HE. Drawing on the responses of these academics, we also contest essentialization of the character of Chinese HE as bounded by inflexible traditional knowledge practices, and point to the experiences of these academics of English-medium education and collaboration as a source of dynamism in Chinese HE. Given the impetus for education institutions outside the EMI sphere to build international reputations and to prepare graduates for international postgraduate study and competition in global employment markets by adopting English-dominant academic literacy practices, we conclude by reflecting on the question of whether these institutions, in the context of rapid change, are gradually embracing a critical approach to the practices of CT.
Chuah, S.-H. (2010). Teaching East-Asian students: Some observations. Retrieved from https://www.economicsnetwork.ac.uk/showcase/chuah_international. Dawson, J., & Conti-Bekkers, G. (2002). Supporting international students’ transition to university. In A. Bunker & G. Swan (Eds. ), Proceedings of the Focussing on the Student: 11th Annual Teaching and Learning Forum for Western Australian Universities, Edith Cowan University, 5–6 February, 2002 (pp. 87–94). Retrieved Feburary 6, 2006 from http://www.ecu.edu.au/conferences/tlf/2002/pub/docs/Dawson.pdf. Kirkpatrick, A. (2011). Internationalization or Englishization: Medium of instruction in today’s universities. Retrieved from repository.lib.ied.edu.hk. Manalo, E., Watanabe, K., & Sheppard, C. (2013). Do language structure or language proficiency affect critical evaluation? Proceedings of the Annual Meeting of the Cognitive Science Society, 35. https://cloudfront.escholarship.org/dist/prd/content/qt4956v4906d/qt4956v4906d.pdf. Top Universities. (2018). University branch campuses. Retrieved from https://www.topuniversities.com/student-info/choosing-university/university-branch-campuses. University of Nottingham. (2018). The University of Nottingham Ningbo China: Study with us. Retrieved from https://www.nottingham.edu.cn/en/study/. Walker, A. W. (2010). 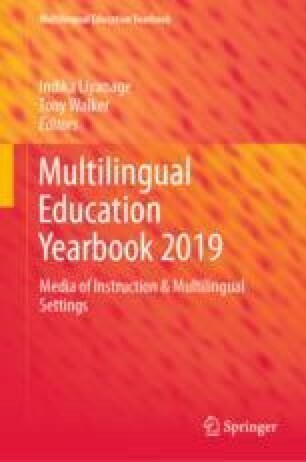 Language diversity and classroom dialogue: Negotiation of meaning by students in an internationalised postgraduate classroom. (Doctoral Thesis). Griffith University, Brisbane. Retrieved from https://research-repository.griffith.edu.au/bitstream/handle/10072/367748/WalkerA_2010_02Thesis.pdf?sequence=1.